Holy Fire Japan: Only in Japan: Super Cars! Only in Japan: Super Cars! A view from the side shows some crazy design alterations to this van. Is that thing legal? I sometimes see them and usually at night they are even more impressive with shiny lights and loud music thumping. The truth is that Japan has a lot of custom super cars! I see almost one every day and the styles vary. And I thought the supped up lower rider was something? Most of the additional parts use hydrolics to literally transform the car into different looks. This group of people who spend vast amounts of money and time on their cars consists of mostly young to middle aged men who dress in extreme fashion as well. I chose an example below. This is the type of guy I would expect to step out of one of those extreme machine cars, not a nerdy guy in a suit. Japan is a country that loves Manga/Anime and some will proudly spend big bucks to show their affinity. Just one of the sides of Japan that makes it such an interesting place to live. Can't say the car looks very appealing, but to each their own. 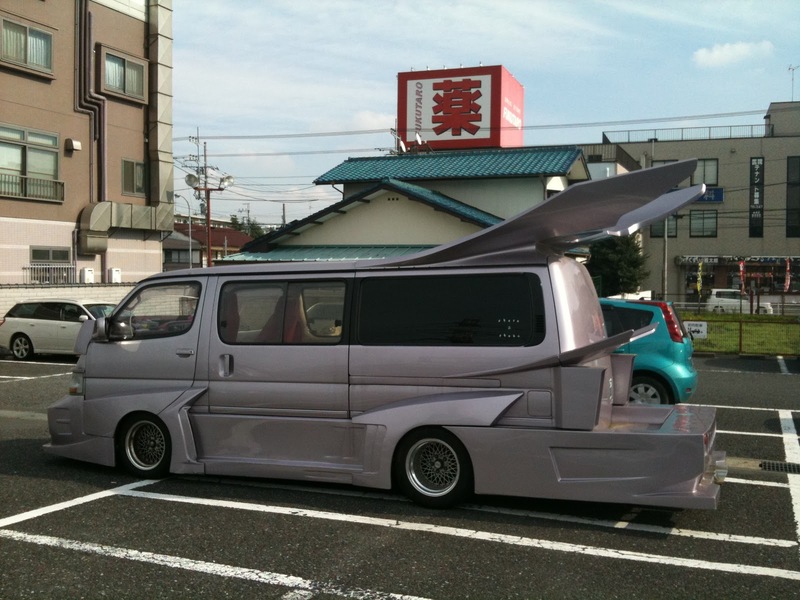 This souped-up van is what anime' is made of. They are borne out the imagination of the Japanese people. Actually, they are near the robot age, and we'd soon be able to see cars that transform into robots.